NEW YORK—The contract between Transport Workers Union Local 100, representing 34,000 subway and bus workers, and the state-run Metropolitan Transportation Authority (MTA), expired at midnight Jan. 15. The MTA is demanding a contract with three years of no raises, increased healthcare costs and other big concessions. The MTA’s demands are an attempt to make working people pay for a crisis of the profit system and its Wall Street crooks. As the union with the power to shut down the financial capital of the world, Local 100’s contract fight impacts struggles far beyond New York City. Samuelsen’s speech was interrupted several times by chants of “Shut it down!” But even so, the contract expired without visible effect. There had been three contract rallies of modest size; the largest had about 1000. For now, Local 100 will be working under the old contract. Local 100 had struck the MTA in 1966, 1980, and again in 2005, the latter a failed 2½-day strike that demoralized workers. The MTA says raises are to be “net zero,” paid for by massive union concessions. Added are $6000 in costs per year per member for health care, the use of part-time workers in buses, and reducing jobs and safety with One Person Train Operation—that is, computerized train operation. Public workers across the U.S. are under attack by Democratic and Republican administrations. Trillions have been slashed from public services. Lost are half a million public sector jobs since the recession. In 2010, over 900 Local 100 members were laid off due to a so-called budget deficit. Most have returned, except for 150 at the start of 2012. Untouched were skyrocketing MTA debts to banks and wealthy buyers of MTA-issued bonds, who receive hundreds of millions per year in tax-free income. In 2011, the MTA paid over $2 billion from its $12.6 billion budget to banks and MTA bond owners. The key strategy of the boss class is to pit transit workers against riders—that is, pit working people against each other—while making the entire working class pay for the crimes of Wall Street crooks. In 2010 alone, there were unprecedented service cuts and a fare hike. Transit workers were portrayed as the prime culprit. Governor Cuomo recently appointed Joe Lhota to head the MTA. During the 1980s Lhota was a top official in the law-and-order administration of Mayor Rudy Guiliani. In 1999 Giuliani imposed a court injunction on Local 100 against striking, which included a $1 million-a-day fine and/or jail for the union, including fines for talking about striking. The injunctions were based on New York State’s notorious Taylor Law, which forbids strikes by public workers. Democrats and Republicans passed the Taylor Law in the wake of Local 100’s successful strike in 1966, which secured greatly improved pensions. Last year, a three-zeros contract with increased employee medical costs and 2% raises in the last two years was rammed down the throats of state workers in the large Civil Service Employees Association (CSEA) and Public Employees Federation (PEF). Cuomo’s bullying included threats to layoff 4500 workers. PEF members rejected the rotten deal after a “vote-no” effort, but finally ratified it after a fear campaign by Cuomo and union bureaucrats. Thus far, Samuelsen has rejected calls to knuckle under to the CSEA and PEF model. Actually, Local 100 salaries already trail workers who serve mostly better-off riders on the MTA suburban lines. Local 100 pay is also less than virtually all other urban mass transit systems. The last two Local 100 contracts were imposed by an arbitrator’s ruling, always a bad deal for unions, cutting short militant action and allowing bureaucrats to duck responsibility. Lastly, a “strike authorization vote” was not taken at December’s meeting. In reality, the important vote merely gives permission to the Executive Board to call a strike, which it seldom does. No such vote sends the MTA a clear signal. Samuelsen has publicly refused to rule out striking. But when questioned, he insists that the Executive Board “has not discussed it,” diminishing the strike threat. In fact, the current leadership took no position at all on the course of the 2005 strike. Today, thousands remain in “bad standing” for non-payment of dues after automatic union dues collection (dues check-off) was removed by a Democratic Party judge for Taylor Law violations in 2005. In January, 20 Albany “pro-labor” Democrats called on the MTA to “bargain fairly” and negotiate a “decent contract.” None of these fakers told the press that they actually embraced and would fight for TWU demands. Last fall, Local 100 initiated two large rallies in support of Occupy Wall Street, attracting up to 20,000 working-class fighters, although mostly not behind union banners. The rallies were historic. Unfortunately, that momentum has not been sustained. Yet, mass action is what the union movement desperately needs, both on the job and off. Union leaders, tied to the Democratic Party, are quite comfortable with borrowing OWS phrases but unwilling to adopt the bold, confrontational tactics of OWS. Unions must flip the script on Wall Street and the 1%. Labor must shut it down to win! 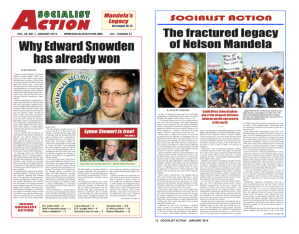 > The article above was written by Marty Goodman, and first appeared in the February 2012 print edition of Socialist Action newspaper.